The UK is one of the most economically unequal societies in the global North. Inequality affects all people within society regardless of their income. Inequality can harm an individual’s physical and mental health, self-esteem, happiness, sense of trust and civic participation. 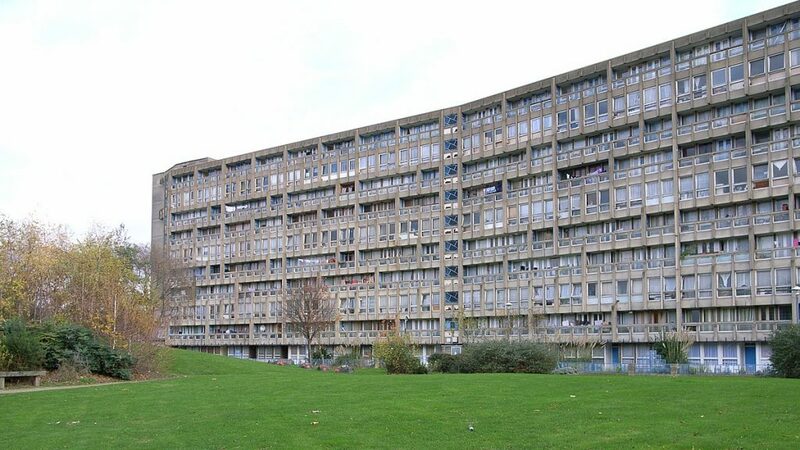 On average people in deprived neighbourhoods in the UK live seven years less than people in wealthier neighbourhoods. Unequal societies have less social mobility as people are not able to reach their full potential, and these societies also tend to have higher crime rates. 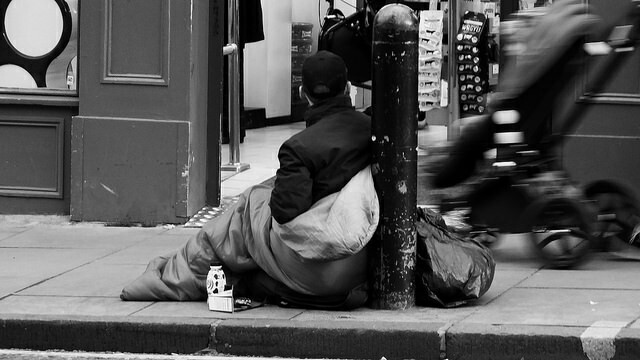 What Does Socio-Economic Inequality In The UK Look Like? Socio-economic inequality relates to disparities that individuals might have in both their economic and social resources that are linked to their social class. These disparities include but aren’t limited to their earnings, education, and/or income. 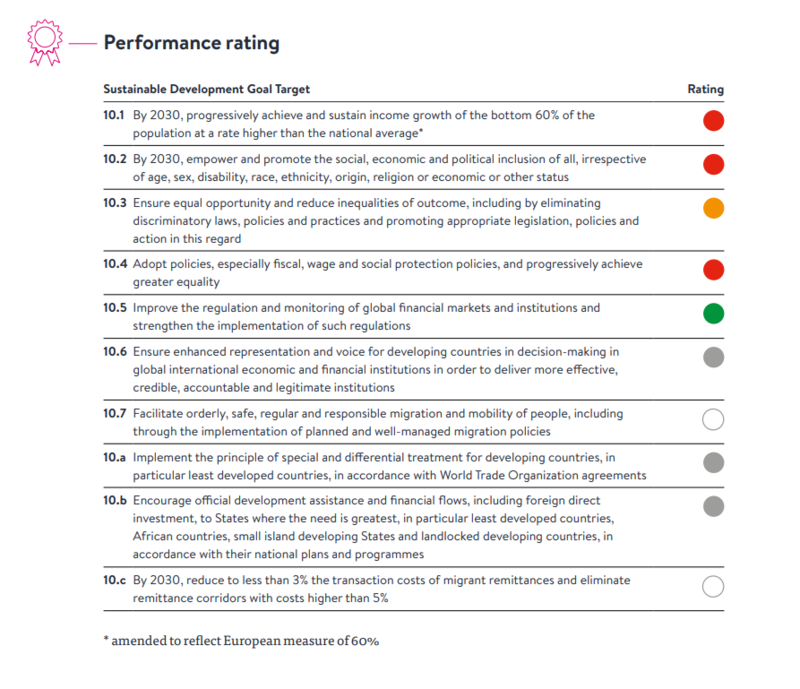 When analysing the UK’s performance against Sustainable Development Goal 10, which targets a reduction in inequalities, Just Fair found that that the UK was doing poorly in the majority of criteria where there is enough data to measure progress. Groups and individuals that face discrimination because of a shared characteristic, such as gender, race or disability, are significantly over-represented amongst the most socio-economically disadvantaged. This is backed up by the Equality and Human Rights Commission’s impact assessment into recent tax and welfare reform that shows that those who are already the worst off have been the most affected by these changes. For example women on average lost £400 per year compared to a £30 average loss experienced by men. 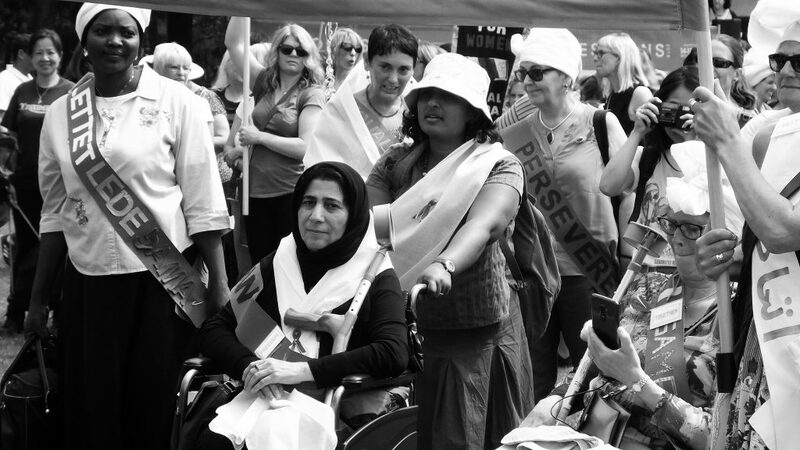 Black and minority ethnic minority households, families with at least one disabled member and lone parents (who are overwhelmingly women) are also amongst those who have suffered disproportionately from these changes. The UK’s richest 1,000 people are wealthier than the poorest 40% of households. Inequality is marked by an uneven distribution of wealth. The Equality Trust highlights that the UK’s richest 1,000 people are wealthier than the poorest 40% of households. This wealthiest 1,000 saw their collective worth grow by £2,615 for every second of 2016. Wealth is also unequally distributed across the regions. In 2016 the top 10 local areas in terms of gross disposable household income per head were in London or the south east. 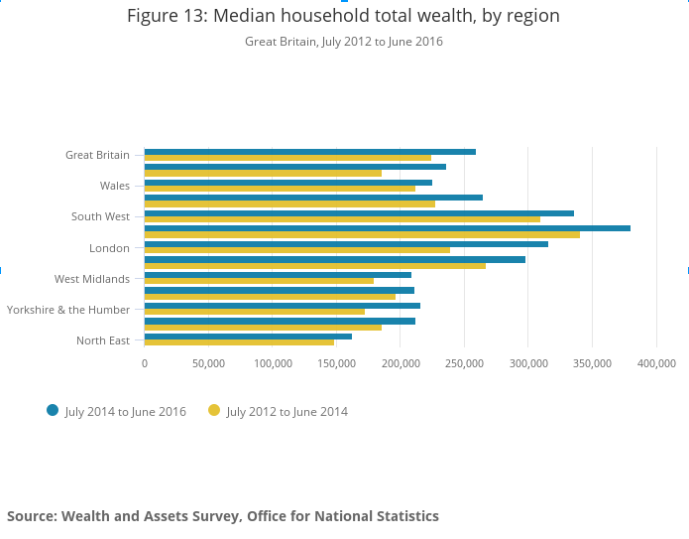 When you look at median household total wealth, again London and the south west come out at the higher end of the scale with the north east coming out on the bottom. Socio-economic inequality undermines our ability to access our human rights. The United Nation’s Committee on Economic, Social, and Cultural Rights has made clear that socio- economic status can be seen as a ground of discrimination. A person’s social and economic situation when living in poverty or being homeless may result in pervasive discrimination, stigmatization and negative stereotyping which can lead to the refusal of, or unequal access to, the same quality of education and health care as others. Inequalities in income can lead to inequalities in power and a situation where those with the most wealth or highest income are better able to realise their human rights. This inequality can present itself in a number of ways. For example, in a local authority that has been forced to reduce its provision of adult social care due to cuts to their budget made by central government, one elderly person may be able to afford to pay for the additional services to address their needs by financing it through their own resources. However another person may not have the financial ability to be able to pay for the additional care that they need meaning they might see their health and overall well-being decline. Furthermore it was recently announced that thousands of pensioners on the lowest incomes will soon be up to £7,000 a year worst off after the Department for Work and Pensions stated that it was going to be implementing a change to pensioners welfare entitlement. When this drop in income is combined with reduced services provided by local authorities you can see how it is essential for the government to conduct cumulative impact assessments on its policies to better mitigate their effect on increasing socio-economic inequalities. Inequality in all its forms was at the forefront of the recent visit of the UN special rapporteur on extreme poverty and human rights Phillip Alston. In his interim report he was scathing in his criticism of UK policies that have contributed to a rise in poverty rates and the rampant inequality that he saw throughout his visit to the UK. What Can Be Done To Tackle Socio-Economic Inequality? “We live in unequal societies but inequality is not inevitable. It is the product of government decisions, actions and omissions that ignore human rights laws and principles,” Koldo Casla – Just Fair policy director. Government could start by assessing the cumulative impact of tax, social security and public spending decisions since 2010, reverse the benefits cap, remove the two-child limit for all families, and crucially restore the link between social security entitlements and the actual cost of living. Social class is not a protected characteristic under the Equality Act 2010, but Part 1 contains what is known as the socio-economic duty. This duty would place an obligation on public authorities to have due regard to “the desirability of exercising (their functions) in a way that is designed to reduce the inequalities of outcome which result from socio-economic disadvantage”. There are currently 78 MPs from five different parties and no less than 70 academics and organisations, including Unison, Just Fair, Amnesty International UK and Child Poverty Action Group, who are all calling on the government to enforce the socio-economic duty as part of the #1ForEquality campaign. We cannot and will not be silent as the UK Government’s damaging tax and welfare reforms threaten to plunge 50,000 more Welsh children into poverty. Imogen currently coordinates the Right to Food Project at Sustain, and works on policy and advocacy for Just Fair. Prior to these roles, she worked across the Middle East, Europe, and South America on human rights projects. View all posts by Imogen Richmond-Bishop. What Is The Human Rights Act And Why Is Theresa May 'Considering Scrapping' It? What is the Human Rights Act and why has the Government reopened proposals to scrap it? Human rights are often criticized for being undemocratic and obstructing government, but that's exactly why they're necessary. The Prime Minister has previously threatened to axe the act, which provides vital protections for our human rights across all areas of our life.